After leaving Coldwater Lake and the Hummocks, you’ll wend your way out of the North Fork Toutle River valley. Vegetation is trying its best to return. In the spring and summer, groves of slender young trees shake green leaves at you, reminding you that life here in the Pacific Northwest can be temporarily routed, but never conquered. Still, the flanks of the ridges are virtually naked. 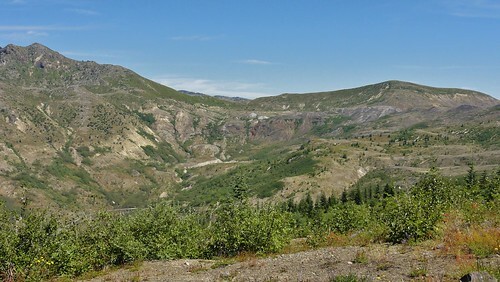 The volcanic history of this region lies stripped and exposed, In places, bits of Mount St. Helens’s modern cone are smeared and plastered on those ridges. A red waterfall cascades down stark, dissected slopes in the distance. Stumps of grand old trees form a gray stubble. In places, logs lay straight and still. They mark the direction of the cataclysmic lateral blast. View of ridges and red waterfall from Johnston Ridge. This is a silent, solemn road for me. As ecstatic as I get over the wonderful fresh geology, I can’t forget I’m on my way to the place where David Johnston died. If you’re able to walk a reasonable distance, you’ll be parking in the main lot, behind the crest of the ridge. Look closely at the pavement. They’re fading now, since Mount St. Helens stopped spitting hot pyroclastics all over the place, but you can still find rusty little scorch marks here and there. The lot was heavily pocked with them when I first visited with my friend Victoria in 2007. They made us realize the volcano wasn’t so sleepy as we’d supposed, and question the wisdom of coming there in a cloth-top convertible. 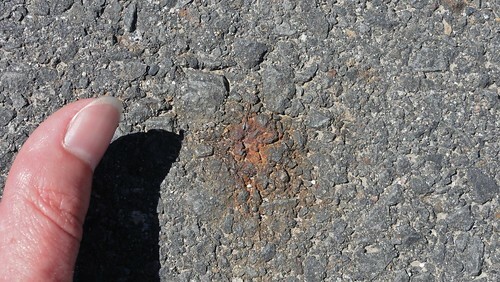 Scorch mark in the pavement at Johnston Ridge Observatory. At the far end of the lot, there’s a trail up the ridge. Take that long way round to the visitor’s center. You won’t see St. Helens just yet. It’s a good time to study the devastated area without her as a distraction. This is a remarkable place for the west side of the Cascades. I’m calling it volcanic desertification. Woods and streams and all of that lush, wet wildland became an instant desert when the mountain blew. Being from Arizona, this feels like home to me: the dry dirt and rock crunching underfoot, the stunted trees, the little plants clinging to the ground, determined to hang in there despite the odds. But this is a young desert, ephemeral: the pyroclastic sands will be turned into soils soon enough, as venerable old forests once again take over from the temperamental fire mountain that destroyed them. If you look to the east, you’ll see the round white top of Mount Adams peering over the shoulder of a ridge. 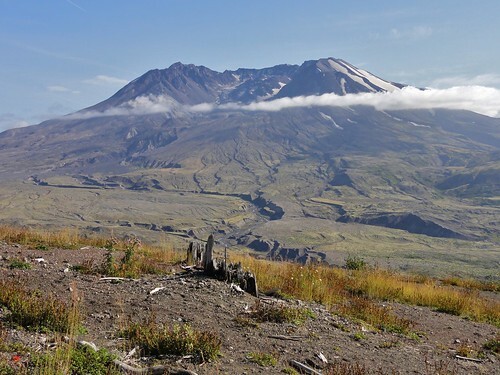 This is a brother to Mount St. Helens, born of the same subduction zone. Climbers on Adams watched her empty her interior to the north; someday, climbers here will watch Adams put on a similar show. Our girl will soon reveal a shoulder as you ascend Dave Johnston’s ridge. She begins by looking like a fragment of a jagged mountain range. Then, gradually, the whole of her comes into view. She used to be lovely and round, sleek, snow-covered, like Adams. Her flanks are once again mantled in white, but this is veiled in gray. Listen: you may hear the rocks fall from those stark, steep crater walls. You may see a plume of dust rise. This is the place for these things. You top the ridge, and stop, because she is titanic. 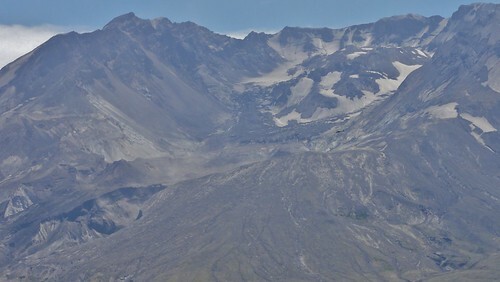 View of Mount St. Helens’s gigantic crater and lava dome. If you look veryvery closely, you’ll see a helicopter for scale. Nothing quite prepares you for that first instant, when you are staring directly into her enormous open crater. You’re practically eye-to-eye with it. Only 5.5 miles (8.85 km) across the valley, the mountain commands your attention. Can you imagine standing here, watching her symmetrical summit roar into the river valley, watching her heart blast out, straight at you? On a clear day, in this place, you will see past, present, and future. Past. First, let’s look at missing time. Have a glance at the plump round top of Adams, off to your left: you can get an idea of what his sister was before those catastrophic May morning minutes. You see that St. Helens is truncated, her top sliced off in a neat horizontal line, her insides hollowed. Quite a bit of her history, the effort of nearly three thousand years of summit-building, ended up spread all over the valley at your feet. Only a shell remains. Look for Sugar Bowl Dome, which survived the May 1980 eruption. 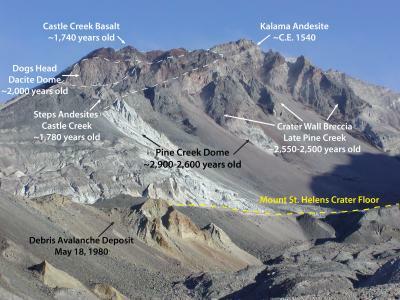 Northeast crater wall above Sugar Bowl, Mount St. Helens with annotated deposits from some of the Spirit Lake Stage eruptive periods. Image and caption courtesy USGS. You’ll see much of her eruptive history on display here. Fragments of andesite from the time when Europeans were just beginning to exploit Columbus’s “discovery” of America survived. So did various volcanic products of much earlier ages, going back nearly three thousand years. But it’s the more recent past that grabs you by the lapels and demands you pay attention. There’s the obvious great bloody hole in the mountain, for starters. There are mounds left by the debris avalanche, bits that didn’t make it down-valley. And there’s that extraordinary, smooth ram extending like an excessively long cravat from the lowest point of the crater rim all the way to the river valley below. This is the Pumice Plain, formed by pyroclastic flows barreling down the breach and heading north. They stopped a mere half-mile (.8 km) from here. You can see, below you, that the lumpy-bumpy hummocks terrain of the debris avalanche has been somewhat smoothed by pyroclastic flow and ash-cloud deposits. Lahars contributed to smoothing things over. And if you look closely, you’ll see pits caused by phreatic eruptions in the deposit. Present. Time marches on; heedless of volcanic eruptions, it continues, relentless. You can see its work here, in the gullies, carved by water, incising the volcanic deposits. The North Fork Toutle River has excavated terraces in the debris avalanche and Pumice Plain. Wind blows the fine volcanic materials, shifting and shaping. Plants are getting their own back, beginning to green barren slopes. Mount St. Helens and the Toutle River Valley from Johnston Ridge. Look up: a plume of dust may be rising from a rock fall in the crater walls. Gravity is tugging mercilessly on those over-steepened bits, aided by cold frost action and frequent rainfall. Future. The mountain goes ever on. She’s not finished, not by half. That dome will continue to grow. I’ll bet my aged cat, whom I love with unwarranted fierceness, that she’ll erupt again within the lifetimes of some of those reading. * We probably won’t see a replay of that extraordinary May 18th paroxysm: she’ll need a long time to build before that. She won’t achieve that smoothly-rounded summit in our short span. But she will, once again, present a serenely-snowcapped summit to your descendants, putting them in mind of ice cream cones. They’ll spend many peaceful hours exploring her noble old-growth forests. They’ll scramble over the rocks left behind by this 20th century episode. And one day, there will be an earthquake. The cycle will begin again. Continue on the path west, toward the visitor’s center. Pause at the granite monument to the victims of the May 18th eruption. Take a moment to read their names. Geologists, monitors, reporters, loggers, visitors are united here. And we remember. They’re more than letters carved into stone. Mount St. Helens and monument. You’ll pass downed trees and shattered stumps, chunks of rock, and spectacular views of mountain and valley. It’s not a long walk before you reach the beautiful Johnston Ridge Observatory. If you’ve made good time and arrived while it’s open, head on inside. You can play with a gigantic topographic model of St. Helens and her environs that tells the stories of the May 18th eruption with thousands of colorful lights. You can see the areas impacted by the lateral blast, the debris avalanche, lahars, and other aspects of the eruption. Excellent movies play in the theater, with a phenomenal reveal of the mountain when the curtain goes up. Interactive exhibits let you feel what the seismometers learn from the shaking ground. You’ll learn what distinguishes different volcanic rocks created by St. Helens, and in one particularly notable display, show you the eruption-blasted trunk of an enormous old tree. The bark on only one side is particularly striking. If you’re there for one of the rangers’ talks, be sure to have a listen. You never know what might happen: she erupted beautifully (and safely!) during one. 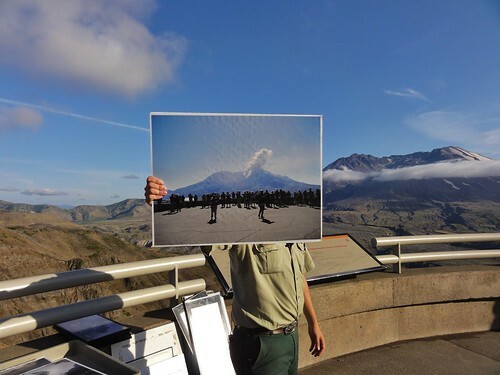 Ranger holding a photo of Mount St. Helens, erupting during another ranger’s talk. Bid our dangerous beauty a final adieu. *The volcano, not the cat. Although I’m positive my cat will also erupt again, and rather more frequently than St. Helens. ← Holy Schist! Dana Hunter’s Gneiss Schist is Open! I am in awe of that crater. I want to see it in real life one day, but even in pictures, the magnitude of the explosion speaks volumes in the wreckage that remains. I remember the eruption, pretty clearly. Normally, something like that wouldn’t have much impact on the younger me, also being from (and at the time, living in) Arizona. My step-siblings were visiting the area of Spokane, though, so we got a lot of reports, and they brought back a couple jars of volcanic dust and some pumice that fell in the area of Spokane. I’ve been to the Ape Caves there, and I need to go back and visit the other parts of the park.